Theatre of Dreams in Castle Rock Presents Hypnosis Show - Only 10 Seats Left! 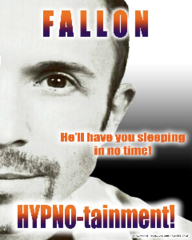 Dynamic, Professional and Comedic Hypnosis Show as seen on Cruise Ships WORLDWIDE! All Shows are Appropriate for All Ages and Audiences! NEVER "BLUE" - & NEVER EMBARRASSES ANYONE! Matthew says: " Hypnosis is just like daydreaming." It is the state of mind we all experience every day, multiple times per day...while reading a book, watching T.V., or even while driving a car. When our breathing and heart rate is slow, our focus narrows and we become very relaxed which is called the Alpha state of mind. Stage hypnosis is completely sage for all involved including the audience when presented by a trained, experienced professional like Matthew! He is clinically certified in Hypnotherapy, a Member of the Association of Ethical & Professional Hypnotherapists and a Member of the American Board of Hypnotherapy and certified by SafeOnStage.com, also. First 30 reservations made will get preferred assigned seating! Credit Cards Accepted. Famous Illusionists Perform in Castle Rock!